We have a range of rear vision cameras and monitors to suit all makes and models of vehicles, as well as truck and bus camera systems to allow for extra vision during normal driving conditions. These systems are becoming increasingly more popular recently due to the increased number of fatalities caused by not having proper vision directly behind the car when reversing. What is the difference between reverse cameras and reversing sensors? 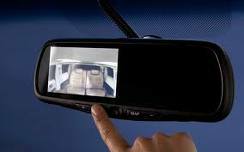 The main difference between a reverse camera and reversing sensors is that a camera will show you what or who is directly behind your car, which is a major "blind spot" for all vehicles. Reversing sensors or "Parking Sensors" will monitor the distance between your rear bumper bar and other vehicles, objects or people behind your vehicle, to prevent damage to a vehicle or property when reversing. A camera will typically not allow you to judge distance as affectively as sensors in most vehicles, but has proven to prevent injuries and significantly reduce the chances of reverse related accidents. 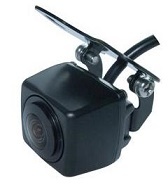 JSO43K - Reverse Camera with Clip-On Mirror Monitor 4.3"
The JSO43K is a great quality Reverse Camera System which comes with a versatile 1/4" Colour camera that can be either flush mounted into a bumper bar or bracket mounted near the number plate. The monitor simply clips over your existing mirror and has a 2 AV inputs to allow for a 2nd camera. 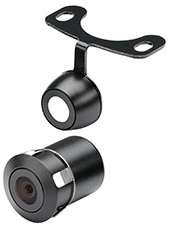 CAMERA - Viewing Angle: 150° Wide View • Protection: IP66 - Water & Dust Ingress • Image: Mirror Image • Illumination: 0.5 Lux Minimum • Lens: 1/4 CMOS Imaging Clip - P1089 Quality Sensor Chip. 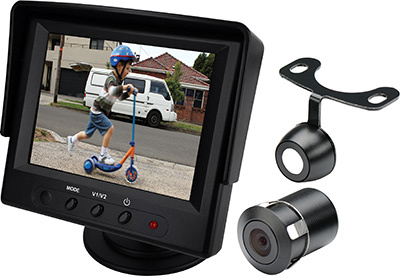 JSO35K - Reverse Camera with Clip-On Mirror Monitor 3.5"
The JSO35K Reverse Camera System is a neat all round kit which comes with a versatile 1/4" Colour camera that can be either flush mounted into a bumper bar or bracket mounted near the number plate. The monitor can be mounted on the dash board or console and has a 2 AV inputs to allow for a 2nd camera. CAMERA - Viewing Angle: 170° Wide View • Protection: IP66 - Water & Dust Ingress • Image: Mirror Image • Illumination: 0.5 Lux Minimum • Lens: 1/4 CMOS Imaging Clip - P1089 Quality Sensor Chip. The RMF-OEM is an excellent choice if you want to retain the original look of your Mirror. Designed to mount on the existing factory mounts, this requires the removal of your old mirror to allow for the new mirror monitor. It also incorporates an auto dimming feature as well as having 2 AV inputs to allow for a 2nd camera. 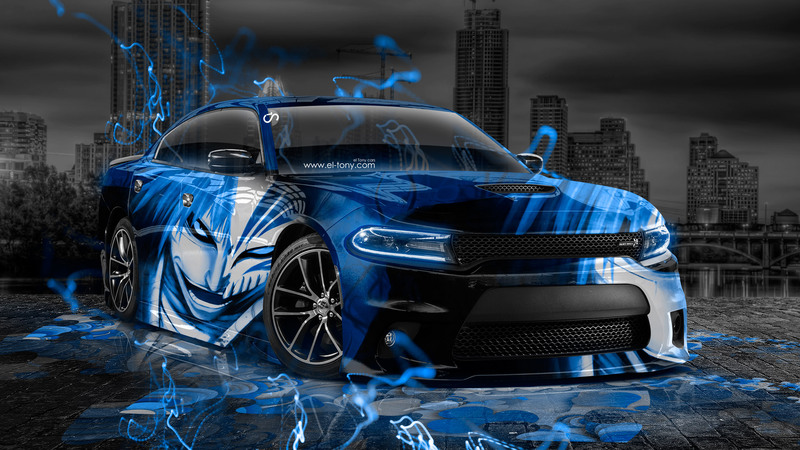 It can be fitted with a range of different cameras. MONITOR - Factory Quality Mirror/OEM appearance • Ultra-High (Ox-x only)-High Bright 4.3” Col TFT/LCD • Auto Bright Adjust/Adjust Guidelines (Ox-x only) • Auto-Dimming (optional) • Dual AV inputs/PAL/NTSC auto switching • Metal (Interchangeable Base) mounting system. 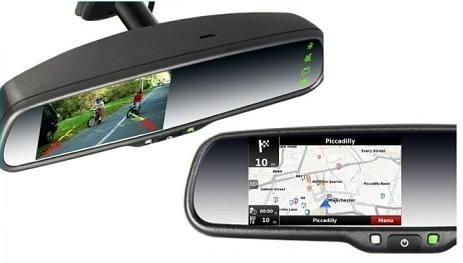 The RMF-GPS - Is a feature packed mirror monitor which offers exceptional picture quality and range of other features including GPS Satellite Navigation with IGO Maps and a built in Bluetooth FM transmitter/SD Card to play media. The RMF-GPS also has the factory look with original style mounting brackets. It can be fitted with a range of different cameras. MONITOR - Built in Navigation with IGO Maps • Bluetooth FM Modulator • Factory Quality Mirror/OEM appearance • Ultra-High (Ox-x only)-High Bright 4.3” Col TFT/LCD • Auto Bright Adjust/Adjust Guidelines (Ox-x only) • Auto-Dimming (optional) • Dual AV inputs/PAL/NTSC auto switching • Metal (Interchangeable Base) mounting system.